Today, we are happy to announce our initial pricing scheme and launch promotions. Many people have asked us what we are going to charge for our novel services – we welcome such questions. In an age when some are charging in excess of $5000 for publishing a single open-access article, we are proud to keep our prices low, but sustainable. You may notice the pricing structure is more complicated than usual. Don’t Panic. In this blog post, we’ll break it down into easy pieces. We think this flexibility of pricing is a positive feature: it reflects that some outputs are less costly to publish, and others are more expensive. We also offer à la carte pricing with respect to optional services such as linguistic editing, PR services and paper-printed copies. RIO is already open for submissions. To encourage you to give it a try, we’re making idea-stage submissions completely free from now on until the end of April 2016. 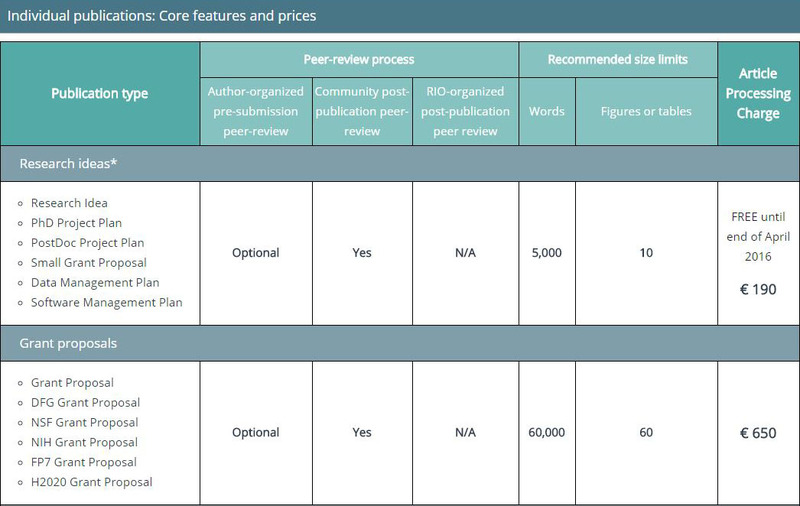 This promotional offer applies to the following output types if submitted through the ARPHA writing tool: Small Grant Proposals, Research Ideas, PhD Project Plans, PostDoc Project Plans, Data Management Plans and Software Management Plans. Very small outcomes have very small prices. We think producing a professional, machine-readable version of your work, assigning it a DOI, and enabling optional community peer review is something worth paying for. At € 50, single-figure publications (see Do and Mobley, 2015) are particularly appealingly priced, so as to encourage the community to explore this new format. 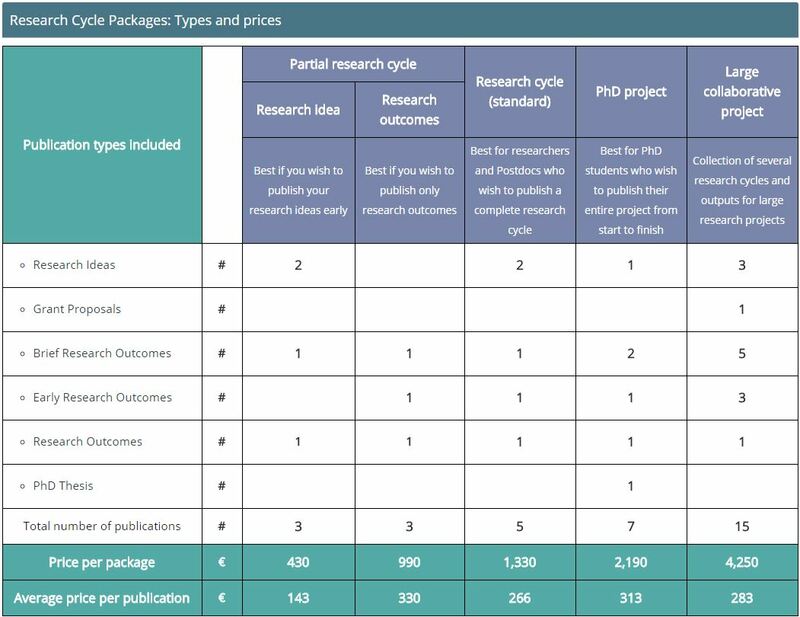 For those who like to compare rates between different open-access journals, you’ll find our research article price very competitive at only €550. Unlike many open access journals, we accept review articles, too, as well as a wide variety of other research outputs. Finally, you might be worried that charging for each and every single output could get quite expensive over time for an individual or an institution. We’ve got that covered with our package plans. 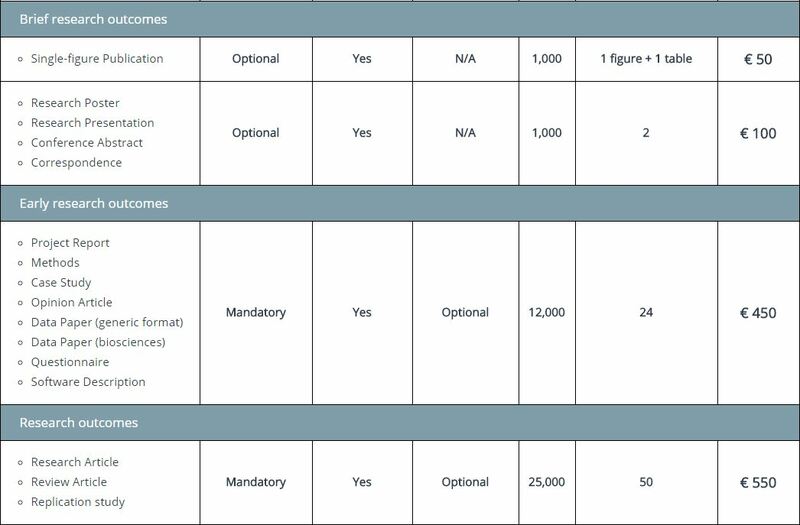 For individuals, if you commit to buying a package upfront, we’re happy to reduce the overall price per output published to an average price between EUR 140 and 330 per article (see table below). 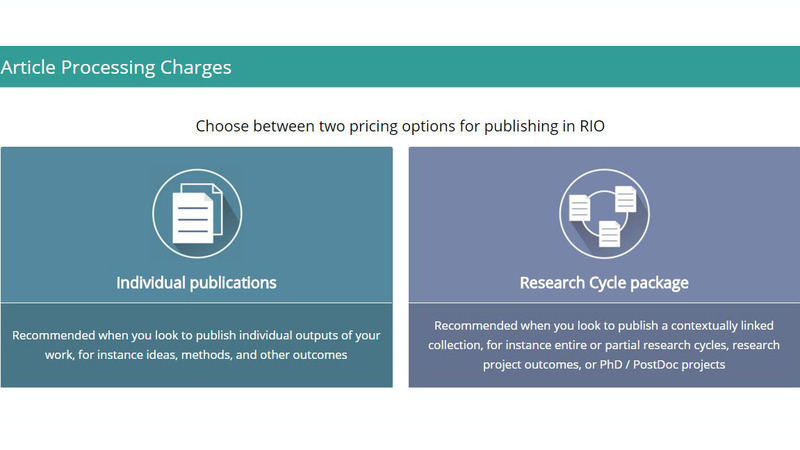 For funders, institutions, conference organisers and others, we’re happy to make even more competitive deals; just contact us to discuss your needs at: rio@riojournal.com. For further details, please see the Article Processing Charges and Promotions entries on the RIO website.